Your gift creates a better world for horses in need! Welcome... It's so nice to see you! "You won't change the world by saving one horse, but you will change that one horse's world." Dust Devil Ranch Sanctuary for Horses is a registered 501(c)(3) nonprofit organization established to prevent cruelty to animals through rescue, rehabilitation, adoption and/or retirement of abused and starving horses. We're located in Cedar City, Utah where we assist in placement and transport of horses throughout the United States. We work with local law enforcement, animal control, veterinarians and other rescue groups such as Best Friends Animal Society in Southern Utah, HSUS, ASPCA and Days End Farm Horse Rescue. 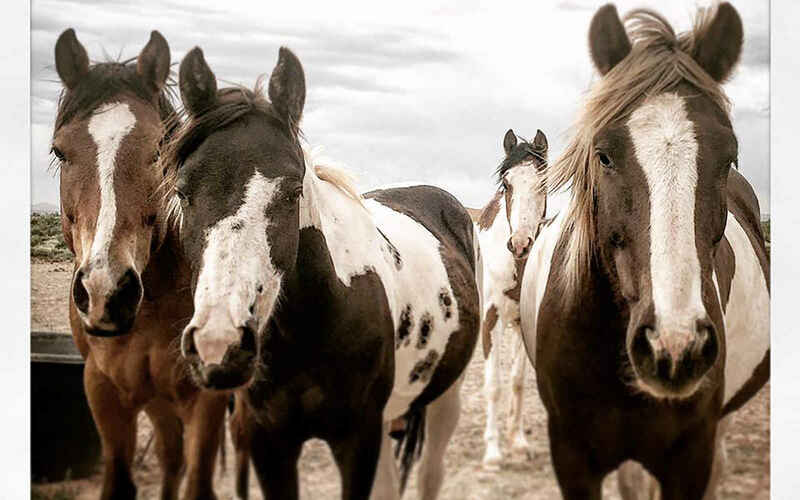 Your gift to Dust Devil Ranch Sanctuary for Horses will help provide food, shelter, veterinary care and farrier services for the neglected, abused and abandoned horses in our care. We do not pay any salaries — we operate entirely with volunteers, so we rely 100% on donations from kind people like you! Your gift will provide these horses with what they need to heal and recover! Please consider giving today and help us create a better world for horses! Thank you for what you do for the love and caring of these beautiful Horses. We just, thank you, for all you do to keep the Sanctuary going. Because I care & appreciate so much what Ginger & her staff provides for the Voiceless! Ginger and her crew do excellent work for these horses and we would like to help in anyway possible. In memory of White Cloud, my childhood pony, who was my best friend. Thank you for your sanctuary.